Per Serving: 1193 Calories; 30g Fat (22.0% calories from fat); 50g Protein; 192g Carbohydrate; 31g Dietary Fiber; 63mg Cholesterol; 1593mg Sodium. Per Serving: 1288 Calories; 46g Fat (30.9% calories from fat); 58g Protein; 173g Carbohydrate; 26g Dietary Fiber; 140mg Cholesterol; 2545mg Sodium. I usually wake up pretty early, and I always have low blood sugar so I like a half a banana and a couple of cups of coffee and then I’m not hungry again until lunchtime. I think I’m going to start planning for this, because it’s how I like to eat anyway. Then I’ll plan on a late snack that includes fruit and maybe some soymilk or other comfort food. It was raining today, so I couldn’t grill the burgers for the family’s lunch. So I switched around lunch and dinner. I made the pigs in a blanket using a recipe I was testing to see if it was good enough to share. It was okay, but not excellent. We ate them and they were good, but not as good as I wanted them to be. They were very affordable though, so that was something at least. Since they were kinda dry I added a tablespoon of barbecue sauce to dip them in, which accounts for the extra Other Carbohydrate. I’m gonna have to get some low calorie barbecue sauce, because the stuff we have is pure sugar. I had planned to eat 4 of the pigs in a blanket, but they were not in the least bit filling, so I went back for another 2 and was still feeling hungry so I had a extra hot dog, just plain. The pigs in a blanket made me want to keep snacking, so for that reason alone, I will be avoiding them. Since I ate so much breading from the pigs in a blanket I omitted the brown rice I was planning on. I would have liked plain turkey dogs, fried with the zucchini and served over the rice, better than the piggy’s. I really over did it on the sodium, because of the turkey hot dogs. I’ll have to remember that so I don’t OD on it next time. I over did the fat this time too, also because of the turkey hot dogs. I have to be mindful of that. Today I realized that my nutritional program MasterCook, does not register Soymilk as a dairy or milk product. It’s divides soymilk up into protein, fat and other carbohydrate exchanges. I’m not sure if that means I should use 7 protein and 5 fat and 1 Other Carbohydrate to make up for it, or if I want to go into the guts of the program and make it register soymilk as a dairy food. Maybe I’ll stick with 6 Starches & 6 Protein, add an Other Carbohydrate and up the fat to 6 exchanges.. That might be easier. I’ll figure it out I guess, one way or the other. I wasn’t hungry much today, but I did feel a little hollow in the evening. I made hot chocolate from the chocolate soymilk and it really hit the spot. I wish I could find a cheaper version of low calorie chocolate soymilk, cause it is soooo good. I was resentful of having to measure everything today, but I did it anyway. God is helping me, ’cause there is no way I could do this on my own. The family’s burgers and fries did not tempt me in the least. Thank you God. Amen. We kept my nephew after school today. He’s 9 and thinks that the food we eat is very strange. I told him that since he thinks our food is weird, I made sure to give him an extra weird snack this time. He loved it! You can see the picture below. 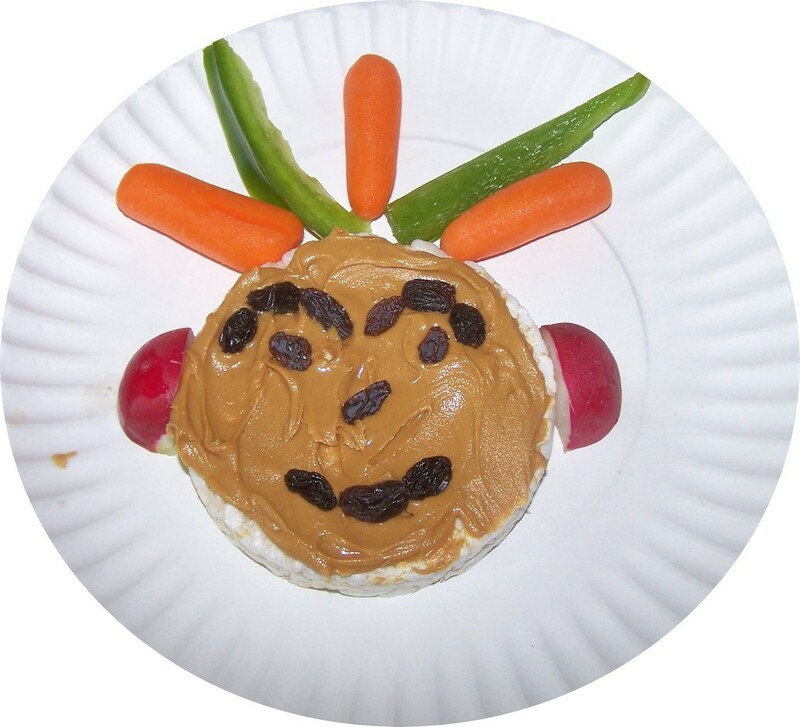 It’s a rice cake spread with peanut butter and topped with raisins to make a face. 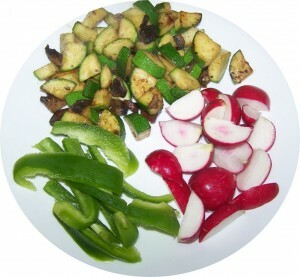 Then radish halves for ears and pepper strips and carrot sticks for antenna or hair. I served it with a glass of apple juice.